Connecting America’s two most sophisticated cities, our road trip includes some of the worlds most staggering natural wonders. This 4-week drive will simply amaze you, creating life long memories by the basket load. Can't decide where to visit? Why not do it all? Fly directly into Boston from the U.K today to start your road trip adventure. After a short transfer from Logan International, you'll check into your hotel. You have three nights to really get to grips with this beautiful, historic city. 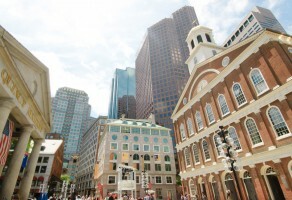 Spend your first full day discovering Boston. The most historic part of the city is the North End. Famous for its cobbled streets, characterful churches and revolutionary past. If you're visiting in the autumn, be sure to try to fit in a whale watching trip. Boats depart regularly next to the aquarium. Tonight, enjoy traditional New England hospitality in the North End with seafood or Italian. Both are superb! Discover more of Boston’s highlights, including a stroll over the Longfellow Bridge at sunset, seeking out 17th-century gravestones, exploring some of Boston’s charming neighbourhoods like Beacon Hill and cheering on one of the city's great sporting teams. Today you'll collect your hire car and start your fly drive adventure west. On your way to Niagara Falls, you could opt for an overnight pit stop in Albany, Lake George or The Finger Lakes region. 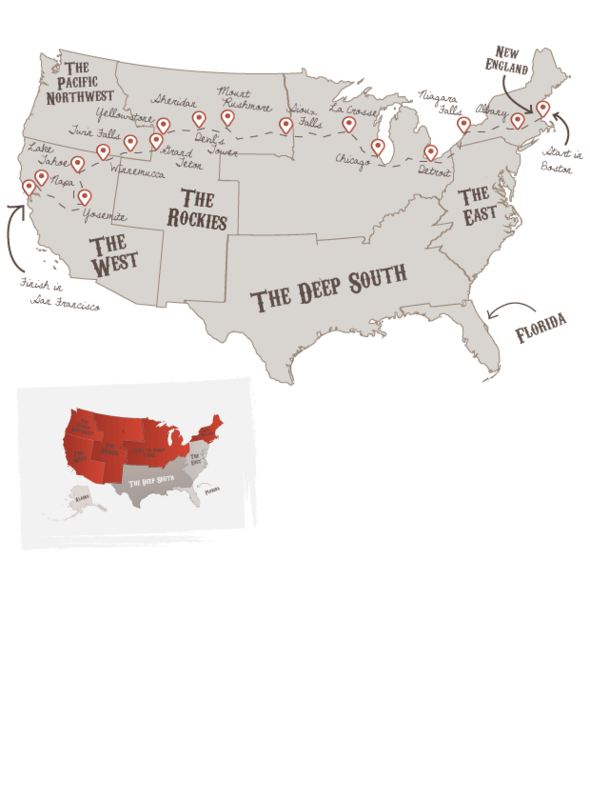 Our helpful Road Trip Experts will help you decide which stop is right for you. Whichever overnight stop you opt for, you’ll get to explore The Berkshires in western Massachusetts en route. Niagara Falls is made up of three massive, separate waterfalls. The largest is on the Canadian side of the falls and is named Horseshoe Falls, whilst Bridal Veil and American Falls are on the US side of the border. Such is the power of the water that passes over the falls, Niagara has moved 7 miles up river since it was formed. Enjoy the day exploring Niagara Falls. A must-do is to take to the water and experience the power of the falls close up. Horn Blower Niagara Cruises operate boats from the Canadian side of the border. Ask us about visa requirements if you're unsure. From Niagara, you’ll continue west following the northern shoreline of Lake Erie. 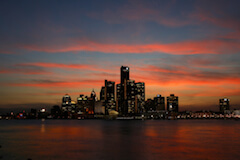 Using Highway 3 on the Great Lakes Circle Tour, you’ll shortcut through Ontario, Canada on your way to the home of Motown - Detroit. Arrive in Motor City; Detroit. The city is boasting a renaissance, now home to two of America’s very best museums. No self-respecting music fan should miss the magical Motown Museum. The Henry Ford Museum is very impressive too and includes uniquely moving exhibits including the car in which JFK was assassinated. Onto Chicago today, as you approach you’ll be able to see the city in the distance boasting some of the tallest skyscrapers in the world. Willis Tower stands some 1450 feet high. Home to an incredible range of architecture, deep dish pizza and an array of world-class museums and art, you have three nights to enjoy the windy city. Chicago is best explored by trolley, bus, boat or bike. Most visitors head to 'Magnificent Mile', a vibrant, bustling area home to upscale shops, trendy restaurants and posh hotels. Landmarks include the historic Chicago Water Tower, the neo-Gothic Tribune Tower and the 100-story John Hancock Center, which has a rooftop observation deck. Exceptionally cold in winter, the city and it’s beaches come alive in the spring, summer and fall. Your personalised Road Trip Pack will detail all of Chicago’s must-see places, these include Cloud Gate, Navy Pier and the lovely Lake Michigan shoreline. Before leaving town, make sure you spend at least one evening partying at Buddy Guy’s Legends. Day 12 brings an optional detour to beer obsessed Milwaukee, which is Wisconsin's biggest city and a great place for a lunch stop before you make your way west to La Crosse. Located on the Wisconsin/Minnesota state line, next to the legendary Mississippi River. Just don't sample too much beer in Milwaukee if you are driving! Leave Wisconsin and drive clean across the open planes of Minnesota and into neighbouring South Dakota. You'll clock three states in just under 300 miles. Finish the day with a visit to Falls Park in Sioux Falls, where waterfalls flow over many tiers of Sioux quartz. Tonight, explore a buzzing downtown district with a burgeoning foodie scene and some of the best eats in the region. The numerous wonders of The Black Hills are a just reward for the long drive across South Dakota today. We think this is arguably America's most underrated area. Jewel Cave National Monument, Wind Cave National Park, Crazy Horse Memorial and Custer State Park are just some of the wonderful sights and experiences found here. Today you'll arrive in Yellowstone National Park. This is the worlds oldest National Park. Founded in 1872, the park has millions of years of history and is home to an abundant range of wildlife including bison, bighorn sheep and bobcats. Accommodation here is really important to get right and we'll all you through all of the options. Head south to Grand Teton National Park today, which more than holds its own amongst its more famous neighbour. The park has a rich mix of extraordinary wildlife, pristine lakes and stunning alpine terrain. To call it beautiful would be an understatement. Grand Teton National park was conceived as a National Park. by the wealthy Rockefeller family from New York. The land was secretly bought up to expand the valley area around the Teton Mountains before being handed over to the federal government for preservation. Less famous and visited than its neighbour Yellowstone, Grand Teton is still a worthy destination for any road trip holiday. As with all our road trips, if the mileage seems too much, just let us know as we’ll pop in additional pit stops in order to slow the pace. Today’s optional highlight is a visit to Craters of the Moon, this National Monument offers visitors the experience to visit and learn about more than 25 volcanic cones. NASA used this location to train Astronauts in the late 1960’s. A day largely for travelling, you'll travel across the border to Nevada aiming for Lake Tahoe. Your Road Trip Pack will have tips on how best to make the most of your journey. Once you arrive in Winnemucca you'll have the night to rest up in this former famous railroad town. Split in half by the California/Nevada state line and completely surrounded by alpine mountains, Lake Tahoe is a wonder to behold. Casinos welcome you to the Nevada portions of the shoreline, whilst classy ski resorts can be found all around. Be sure to take in some or all of the super scenic 71-mile shoreline drive which surrounds the lake. From November to May, you’ll enter Yosemite from one of the West entrances as the Tioga Pass on the east side is usually closed during these months. Either route is a super scenic drive. The maps and route advice within your personalised Road Trip Pack will tell you more. Yosemite National Park is over 1,180 square miles of nature at it’s very best. The most visited area of the Park is Yosemite Valley. Vast rock faces, crystal clear waters, staggering views and stunning waterfalls combine to make Yosemite a real national treasure. Leave enough time to visit Glacier Point, which is best viewed during sunset and it offers the best views in Yosemite. You don't have to like wine to enjoy this area. These two neighbouring valleys offer stunning scenery made up of perfectly manicured vineyards stretching across rolling hills that can be enjoyed by car or even on an early morning hot air balloon ride. This is food heaven too, with places like Thomas Keller’s French Laundry and the rather more affordable Gott’s Roadside burger joint. Additionally, you can take a drive along one of our favourite roads in California, The Silverado Trail which parallels the St. Helena Highway passing through scenic wine country. Onto the last stop today - San Francisco. On the way, you’ll pass through wonderful Marin County. Drive over the Golden Gate Bridge and return your hire car. You have two nights to enjoy the city. This afternoon you may want to ride a cable car or explore on foot climbing the famous steep streets. Full of Victorian charm, famous movie locations and an unrivalled waterfront district, San Francisco has it all. A second full day to explore San Franciso's must-see places. Included in your personalised Road Trip Pack, you'll find our favourite recommendations. Coit Tower, Lombard Street, the Painted Ladies, Union Square and Alcatraz are just a few to get you going. If you're flexible, adding an extra night here is well worth it. Otherwise, check out of your hotel tomorrow and fly back to the U.K.
Don't forget to check out this road trip's Itinerary tab to see more amazing pictures from our 'Northern Crossover' tour. You'll also be able to read a little bit about what you'll be getting up to on each day of this incredible road trip adventure.